Tree standing at icat college in chennai, India. It is pencil drawing of a tree grown in icat college of design and advertising (communication). 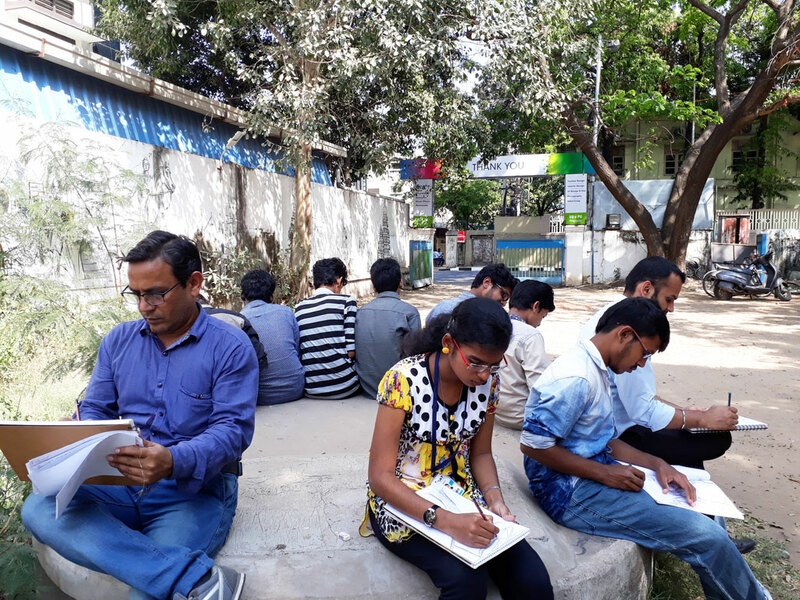 we were sitting in front of this tree to sketch it into the sketch book of icat college. 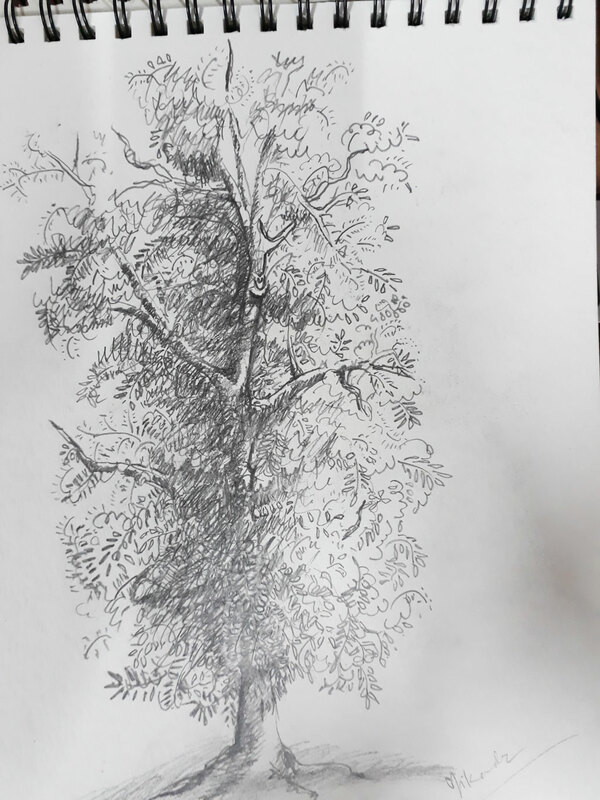 The tree drawn by me with pencil, i tried to add some light and shades of that time, it was around 3 pm in the afternoon when we were teaching some students about drawing and sketching at icat college. We sat in the parking and started sketching the trees around us. 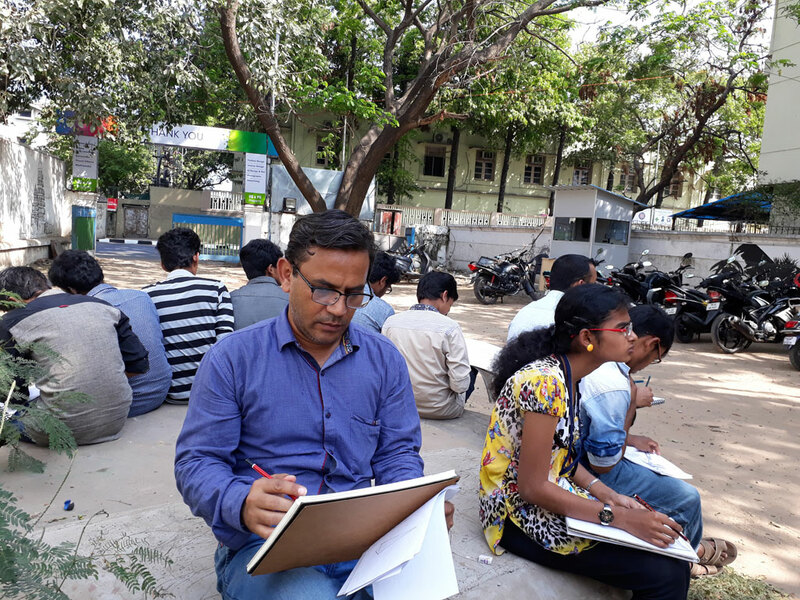 students of icat were learning the sketching and drawing of nature. So we decide to draw trees, some students were drawing tree stem, some leaves and some were drawing n the whole tree. 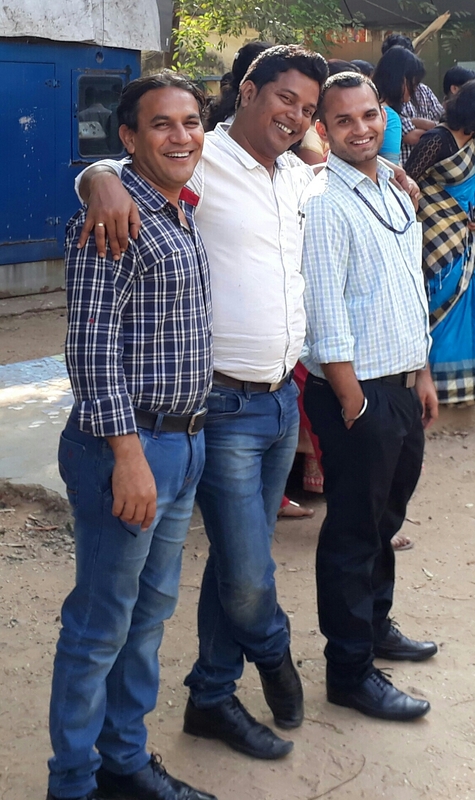 It was nice afternoon at the college. Students of icat college playing a traditional sport matki fodo with stick . 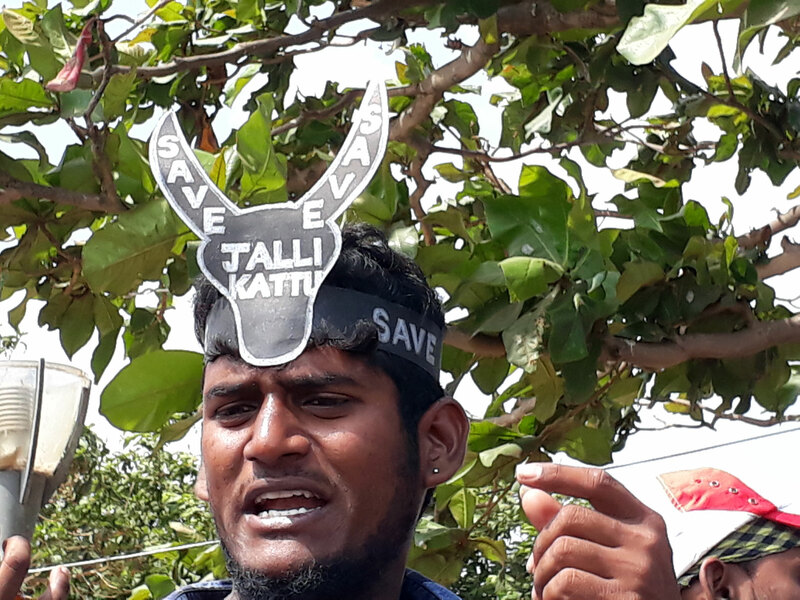 The question is what is Jallikattu? So I will give you some brief about this sport. 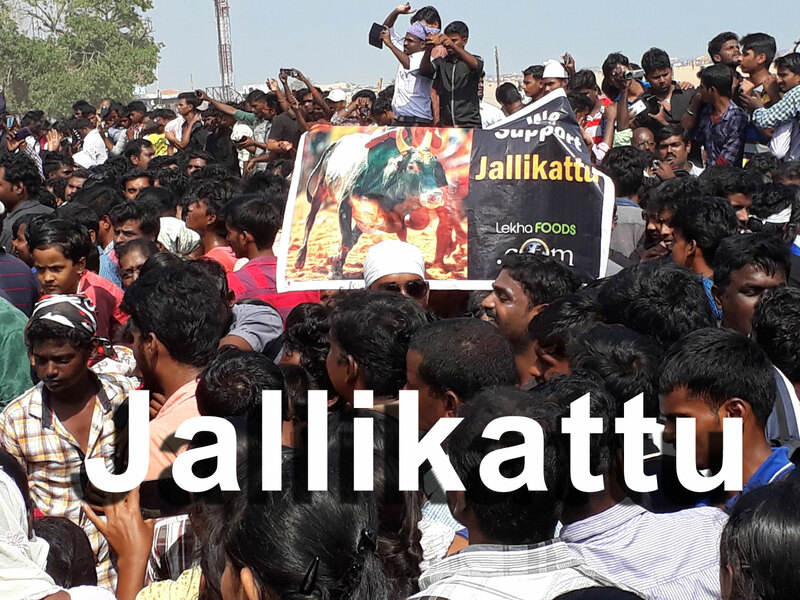 There is major a festival of Tamilnadu named PONGAL, during this Pongal festival celebration the people play the traditional sport Jallikattu, it is a sport of power played during this festival. 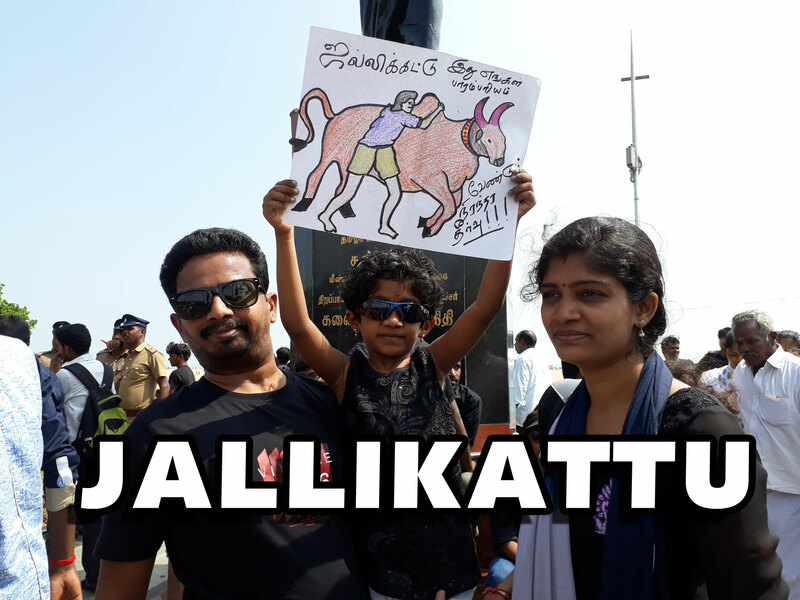 People prepared the bulls for whole year and at the time of festival they leave them in the crowd, and the game is that the people have to take control of that bulls by holding his hump by both the arms and get reward by taking money and sometime flag attached to the bull’s horn. 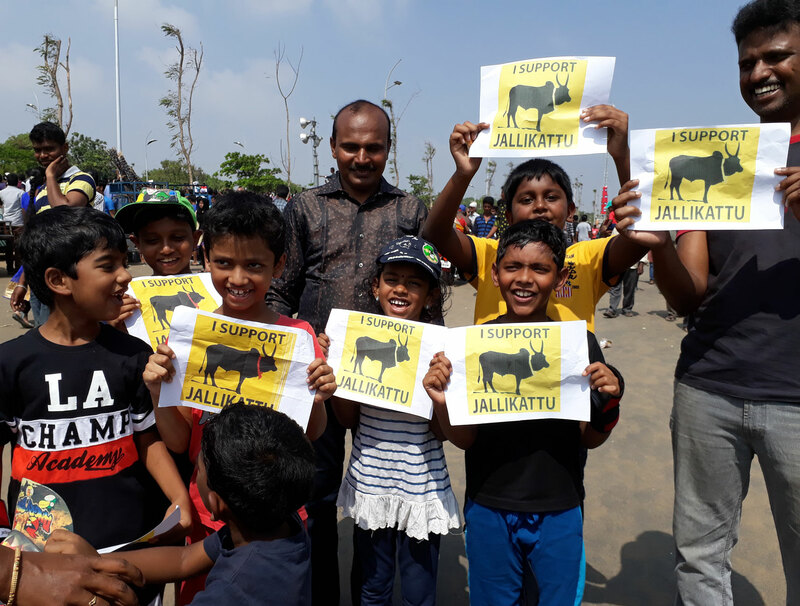 Jallikattu is a soul of Tamilnadu and people are emotional attached to it. However several people die and injured every year. 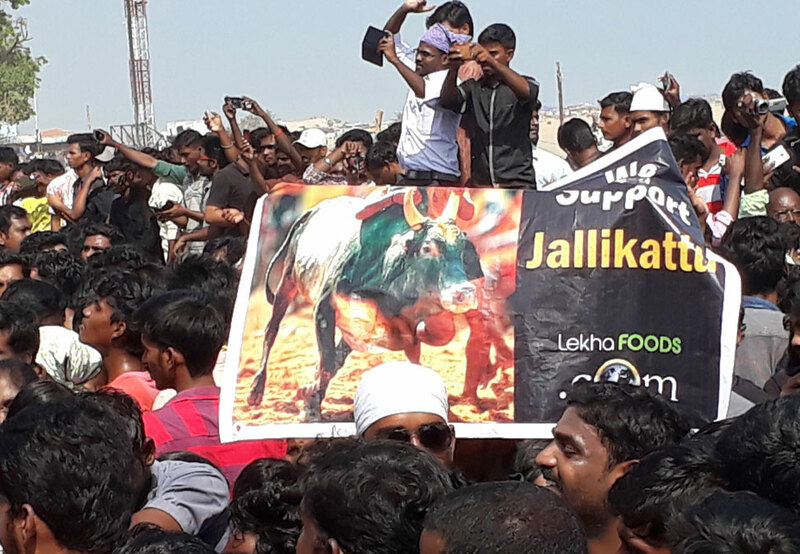 Supreme Court of India wants to stop this sport to stop the cruelty against animal and to save human life. 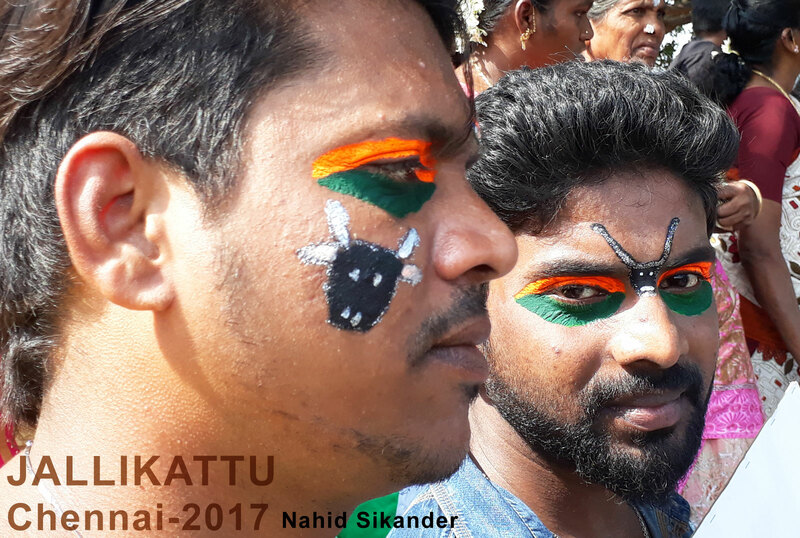 Although the people of Tamilnadu take it as a traditional gift from their ancestors, and follow this tradition with the brave heart and make this cultural event a sport of power. 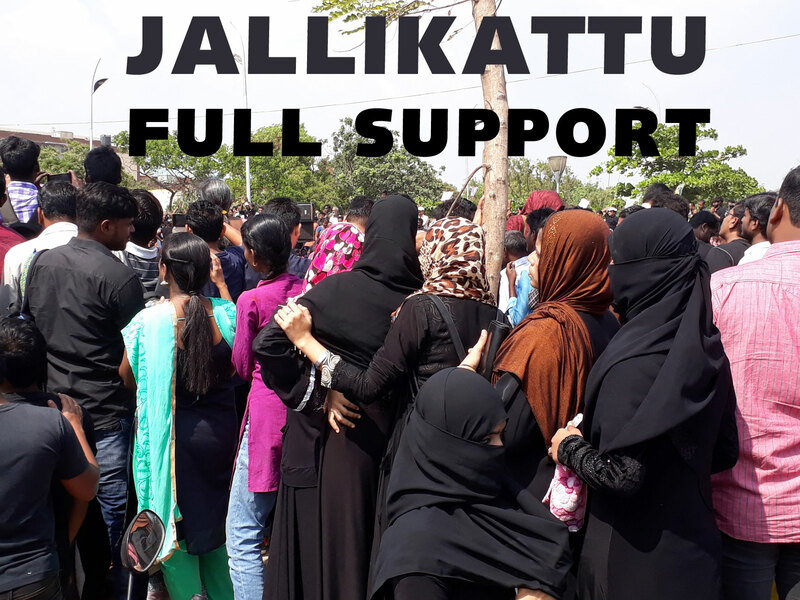 These days Chennai and other part of Tamilnadu are facing the crowd protesting against the Govt of India and Supreme Court decision. However the decision is still pending for a week. 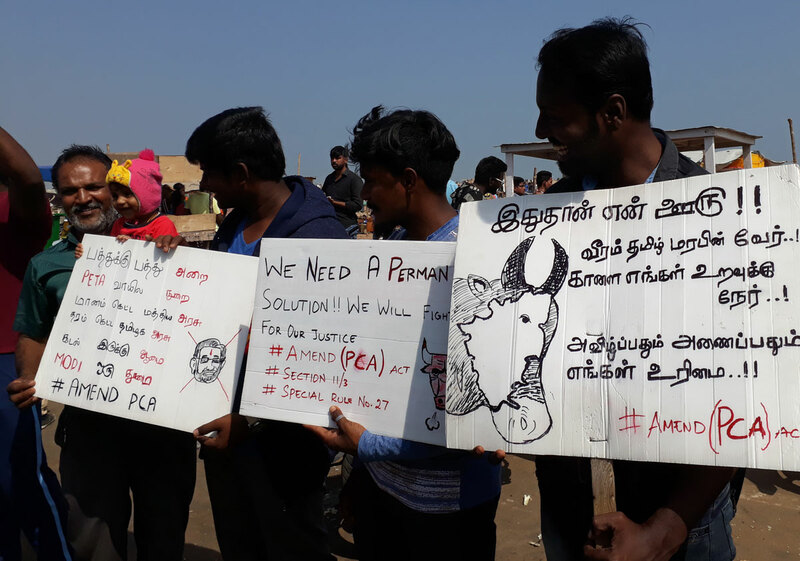 People are protesting at Marina beach Chennai, it is the second largest beach in World, thousands of people gathering together with holding the posters and banners with shouting several slogan written on them, and also shouting the slogans in support of the tradition. 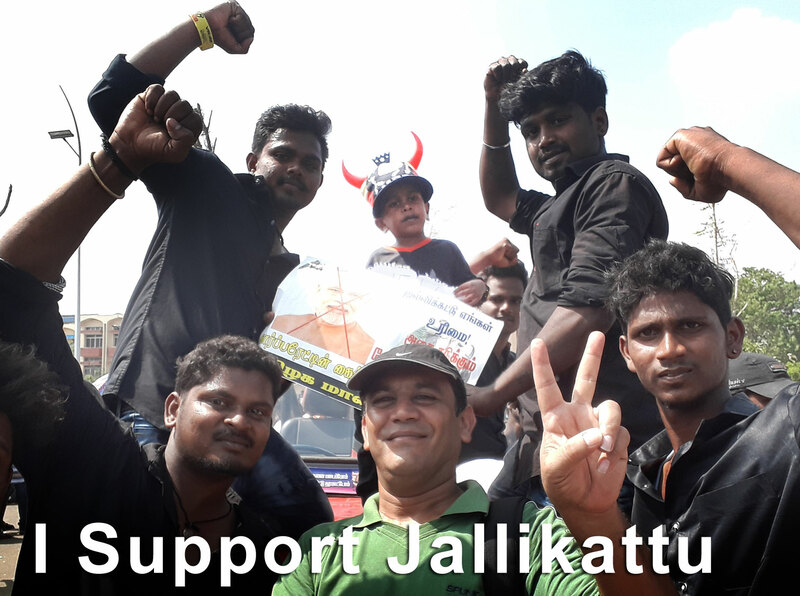 People from all over the Tamilnadu gathering together at Marina beach, the families, kids, youth, farmers, students everybody is coming to support this cause. 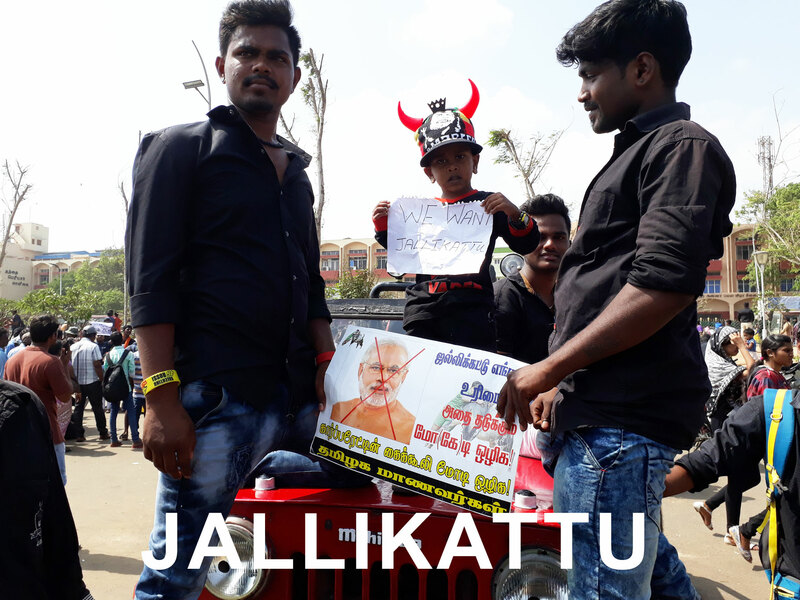 People are coming at their own from every religion and every regions of Tamilnadu. People are united and fighting for one state one cause. I have seen families with kids holding posters and dressed differently. It is the view of a peaceful protest I have never seen before. Some people bringing food to distribute, others are distributing water and fruits, some people took responsibility them self to manage the traffic, some took to manage the walking crowd. Some are picking up the waste material like water pouches, empty water bottles, garbage etc. and keeping the road clean. People came across the Tamilnadu with the music instrument and playing folk music and dance. 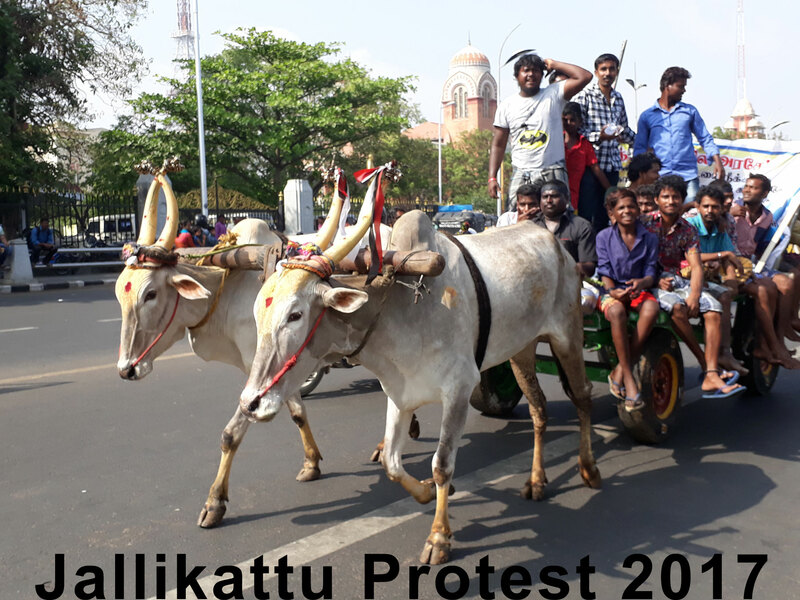 Even they carrying live bulls with them, and travelling with the bullock cart. Ladies are also taking part eventually. 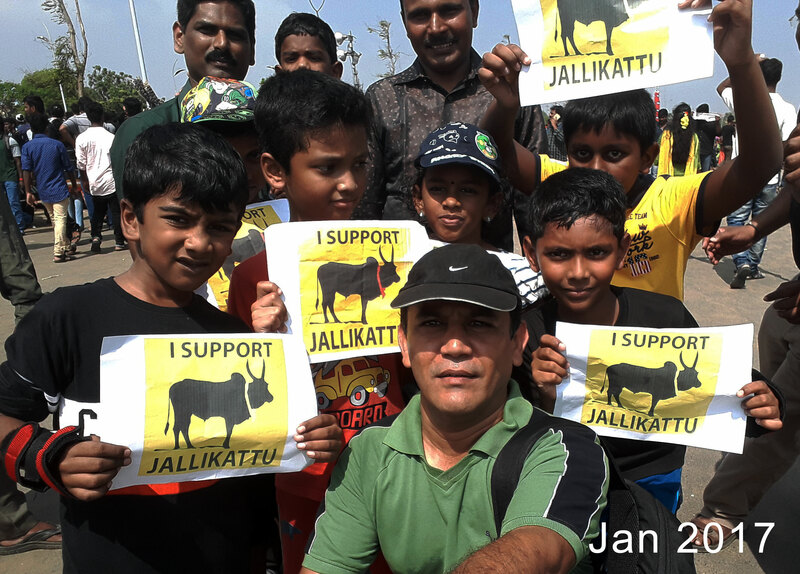 People are coming from every age, every religion, every city, and every street to take part in this eventful peace protest in support of Jallikattu. Different music groups were playing music and people were dancing, singing songs, shouting good and bad slogans, showing poster made by hand and computers, Children made poster with hand drawing and paint them with different colours. Hundreds of police men and women were there to control the public. 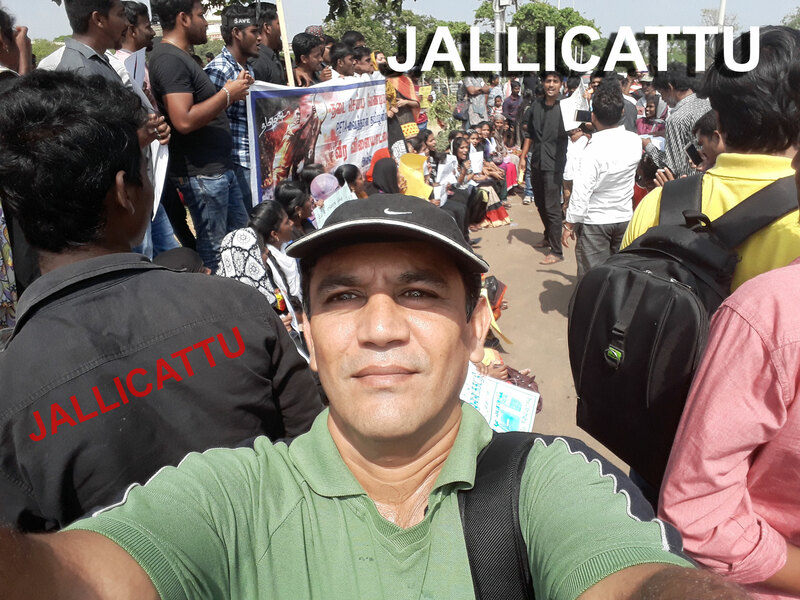 People were helping police in all the activities. 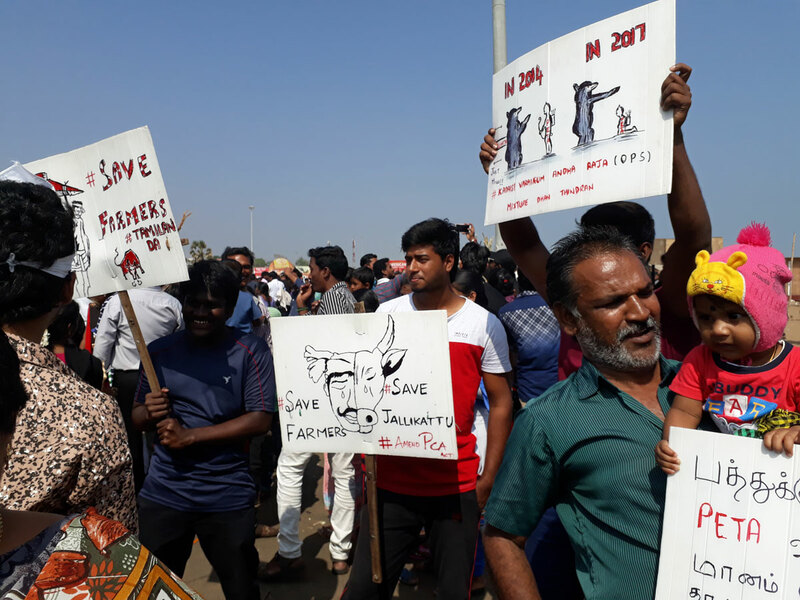 I have never seen this big protest in my life, and the interesting thing is that several thousand of people are joining hand to hand at Marina beach Chennai, but fortunately no any misshaping happened here, no any snatching, pick pocketing and any other activity. 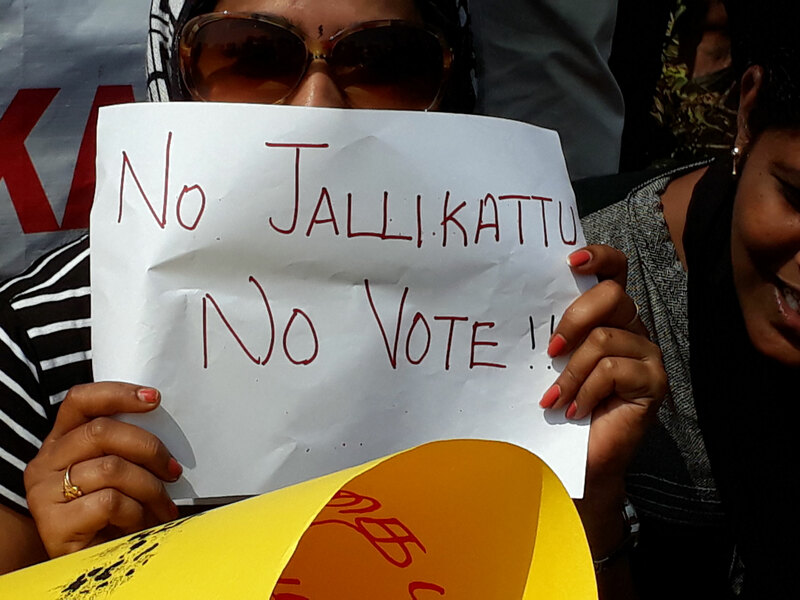 People are so secure in Chennai. 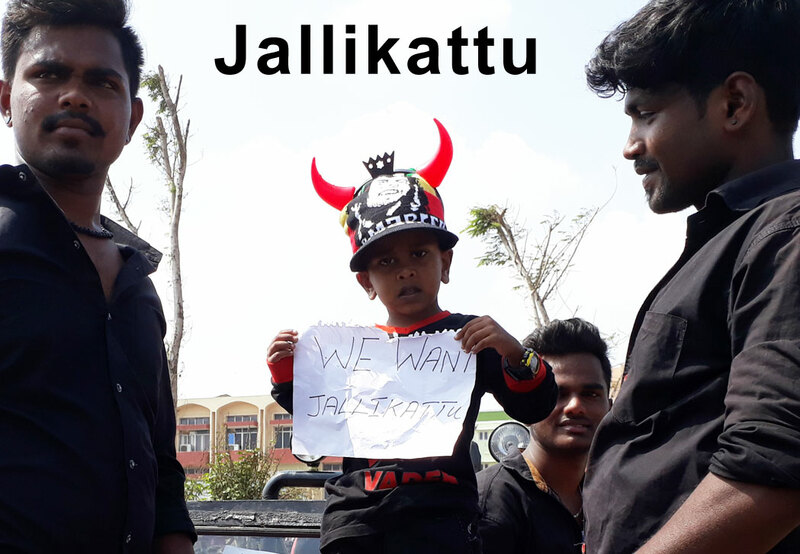 Tamilnadu people love their tradition; they preserved their culture and show unity on these issues. 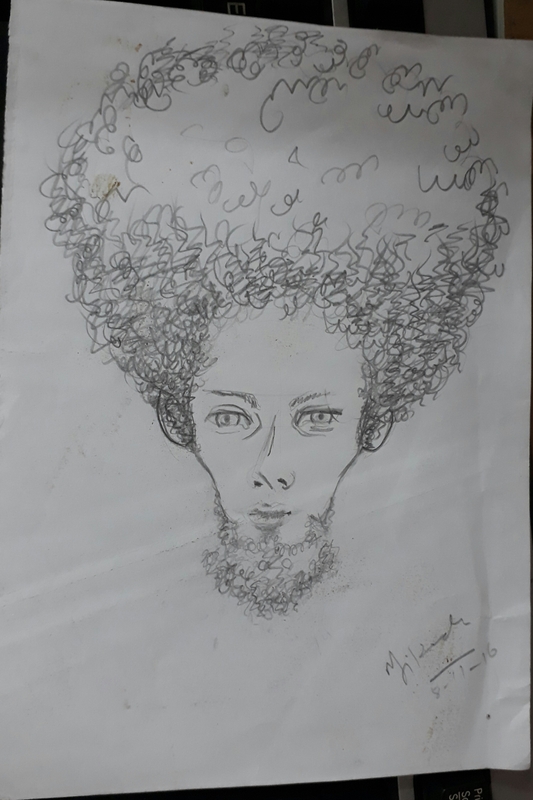 Bony scaria – Portrait sketched by pencil and try to draw caricature of a student in art college Chennai India. Portrait with long curly hairy head. 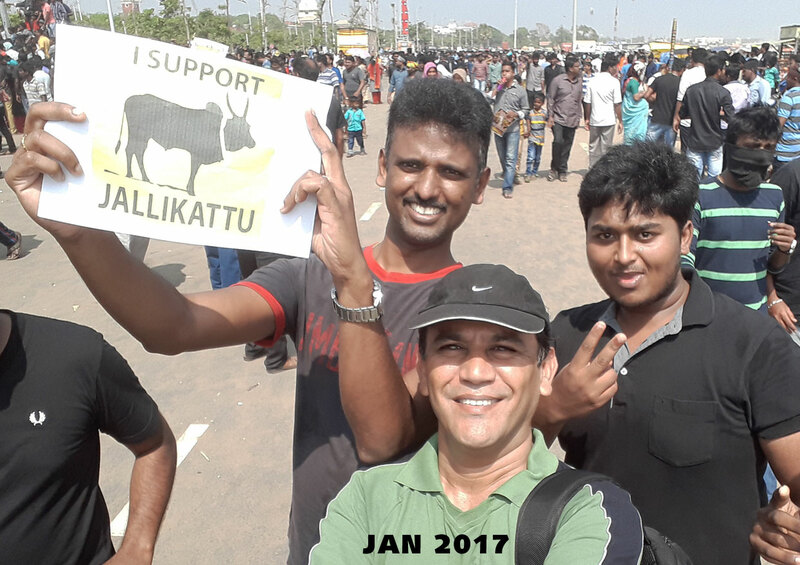 It was nice experience at marina beach Chennai at the time of Pongal festival. 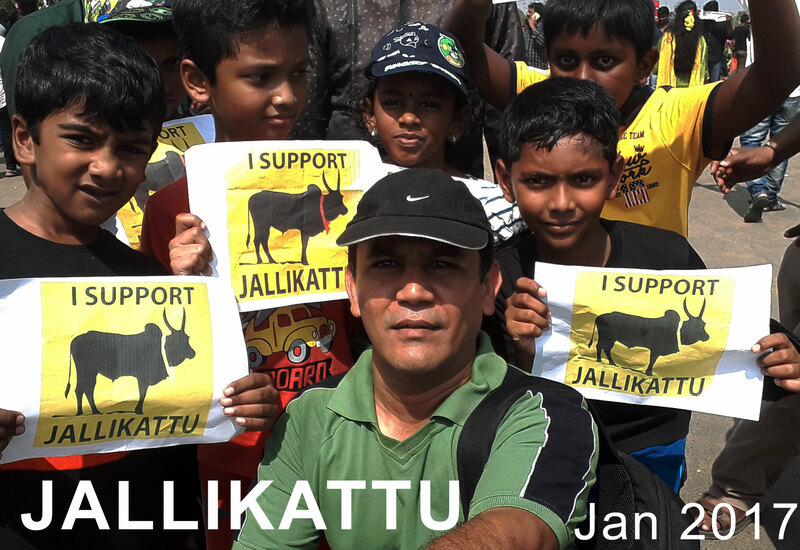 It is the biggest festival of Chennai and a large number of people celebrate it. We also net to sea beach where a large number of crowd tethering and enjoying on their own. 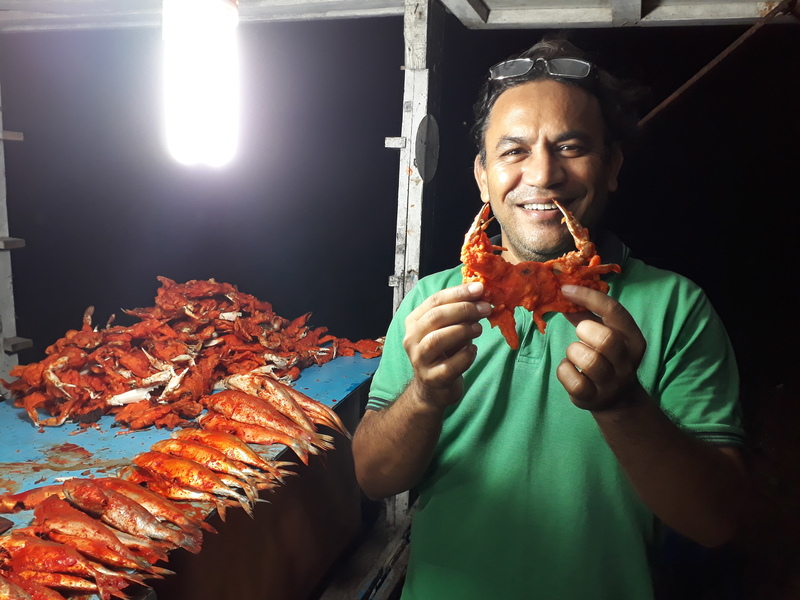 There are several fish stall at marina beach fry fish and serve to the people. The price is very cheap and you can have a nice piece of fish at very reasonable amount with the local Chennai taste. We tasted fish and crab. So it is a lovely place to explore and for those who are a fish lover. 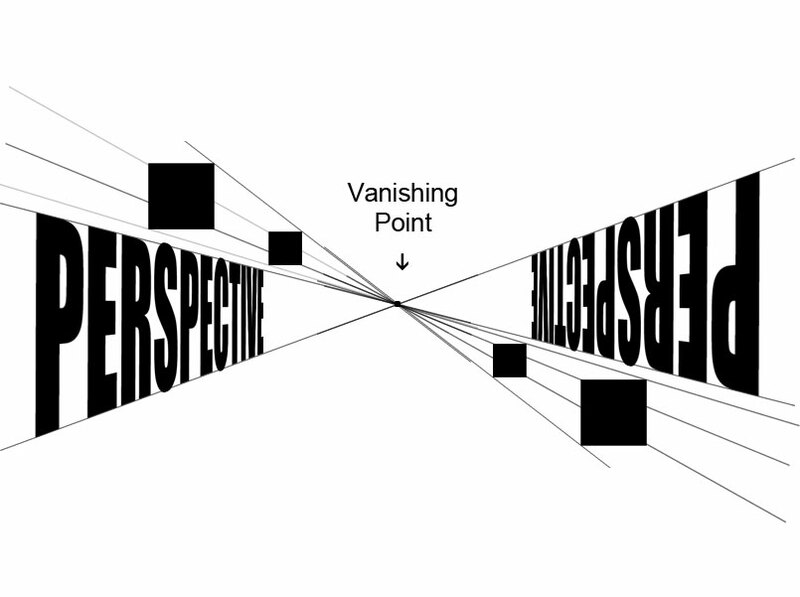 perspective with vanishing point: Image above is presenting perspective and have vanishing point. Clearly can see the vanishing point and image also have boxes showing perspective through lines and finishing at vanishing point. 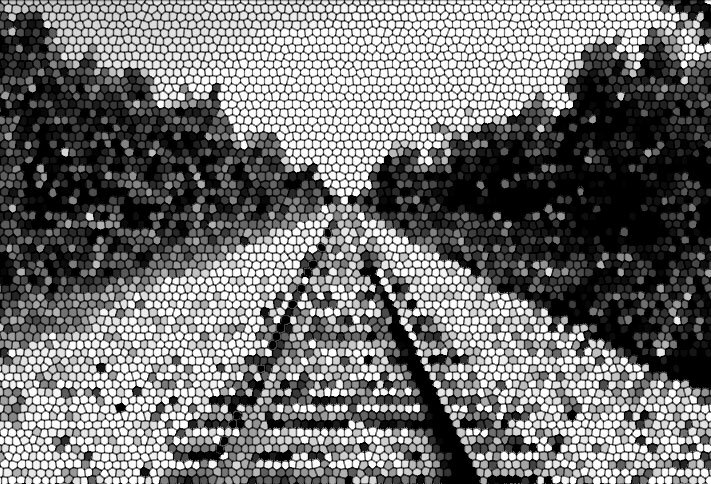 A scene of perspective: All the hexagon pointing out to the vanishing point of perspective at the horizon. The train track is the best example to show the basic perspective. This is train track heading toward vanishing point and all the bushes at the both side have great perspective view.